Then, there’s the varroa mite. Creighton said this parasite is the number one killer of bees in Connecticut. It feeds on bees, can cripple their newborns, and spreads disease, which honey bees can pass on to other pollinators at shared flowers. A small mite is causing big trouble for New York’s honeybee population and putting in peril the fruit and vegetable crops that depend on these pollinators. The following is CRE’s presentation to USDA/NIFA’s Listening Session on its National Monitoring Plan for Native Bees. A pdf of CRE’s presentation is available here. i. Robustness. The collected data needs to be robust. ii. Inferences. The sample size needs to be large enough to permit knowledgeable inferences. i. DQA Requirements. The models need to comply with the transparency, reproducibility and other requirements of the Data Quality Act. “The National Monitoring Plan for Native Bees: Stakeholder and Public Listening Session Webinar” is the first step towards developing a national monitoring plan. The listening session will be held on Wednesday, June 28, 2017 from 8:00 a.m. to 3:30 p.m. and will gather input from a diverse range of people who are interested in native bee diversity, abundance, and large scale national monitoring strategies. Everyone is welcome to participate in the listening session by webinar. A few days before the event, NIFA’s Web site will include details about the webinar. BATON ROUGE — Two Louisiana State University researchers are getting nearly $1 million for a two-year study of how mite treatment and stress affect honeybee health. Kristen Healy and Daniel Swale are working with U.S. Department of Agriculture researchers in Baton Rouge and the nation’s largest beekeeper, the LSU AgCenter said in a news release Thursday. Here in Washington state, we’ve been making a major contribution to healthier bees since I helped kick-start Washington State University’s research program. Now WSU has a diagnostic lab to which beekeepers can send bee samples to be analyzed for disease and parasites. And recently, using our state’s abundant controlled atmosphere storage facilities, we’ve begun controlling varroa without chemicals, ‘suffocating’ them with carbon dioxide in these facilities while sheltering our bees from damaging winter weather. Varroa mites can’t develop resistance to not breathing! WASHINGTON, D.C. June 20, 2017 – The U.S. Department of Agriculture’s (USDA) National Institute of Food and Agriculture (NIFA) today announced seven grants totaling $6.8 million for research and extension projects to sustain healthy populations of pollinators, which are crucial to the nation’s food security and environmental health. The funding is made possible through NIFA’s Agriculture and Food Research Initiative (AFRI) program, authorized by the 2014 Farm Bill. 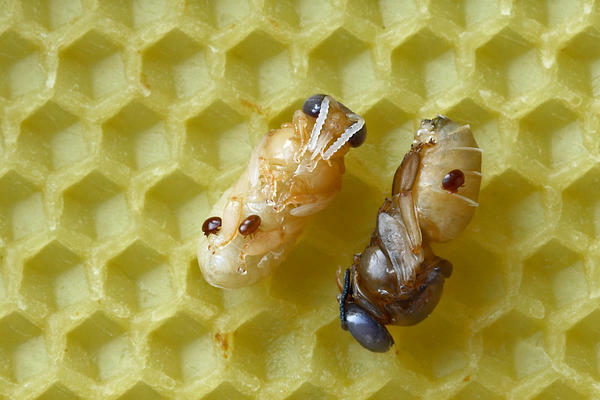 As the managed honey bee industry continues to grapple with significant annual colony losses, the Varroa destructor mite is emerging as the leading culprit. And, it turns out, the very nature of modern beekeeping may be giving the parasite the exact conditions it needs to spread nearly beyond control. In an article recently published in the Entomological Society of America’s Environmental Entomology, researchers argue that the Varroa mite has “co-opted” several honeybee behaviors to its own benefit, allowing it to disperse widely even though the mite itself is not a highly mobile insect. The mite’s ability to hitchhike on wandering bees, the infections it transmits to bees, and the density of colonies in managed beekeeping settings, make for a deadly combination. In three columns, I have investigated the question of bee colony collapse and neonicotinoids (neonics), the effect of pesticides on pollinating insects and natural pest predators, and finally the services that biodiversity renders to agriculture and the economy. I observed that a simple ‘allow or ban’ decision on neonics may not be adequate. What other mechanisms and possible outcomes do we have at hand in the regulatory process? This is the final of four columns on neonicotinoids and their possible effects on bees, and on the wider issue of biodiversity and its importance to agriculture. Published on 2 May, 4 May, 15 May and 17 May 2017.